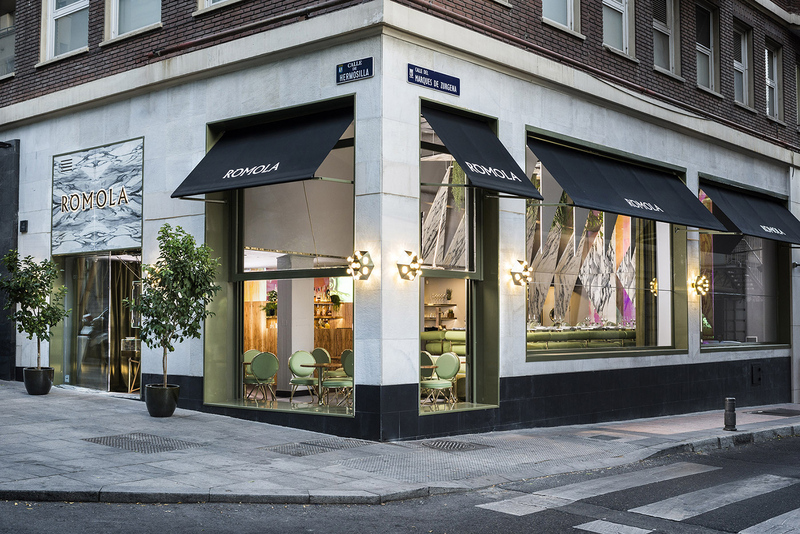 Clean-eating restaurant Rómola recalls the glamour of old Madrid. 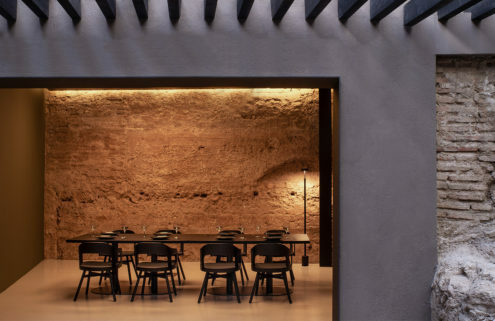 Designed by architect Andrés Jaque – founder of the Office for Political Innovation – the nutritious eatery takes over the former garage of a building in the city’s Salamanca district, originally designed by Luis Gutiérrez Soto in 1946. 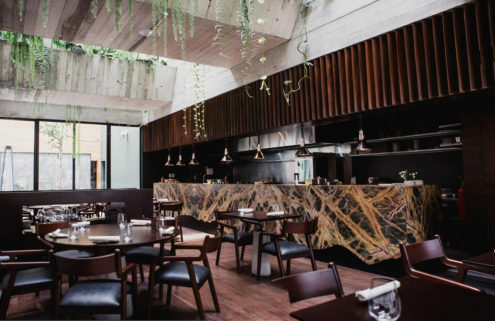 Jaque has taken cues from the Madrid building’s past to transform it, with the garage’s openings refashioned as sliding windows that flood the street-level restaurant with light. 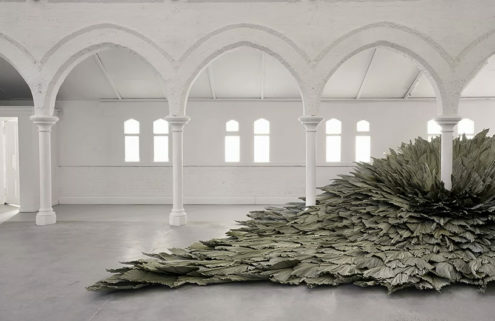 During summer months, they transform the space into an airy terrace. 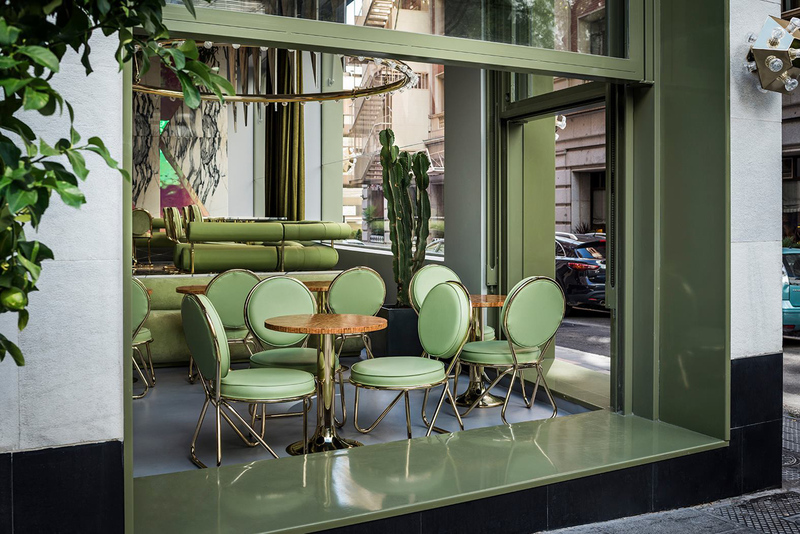 Rómola’s interiors hark back to the traditional coffee shops and cantinas that dotted the Spanish capital in the first half of the 20th century. 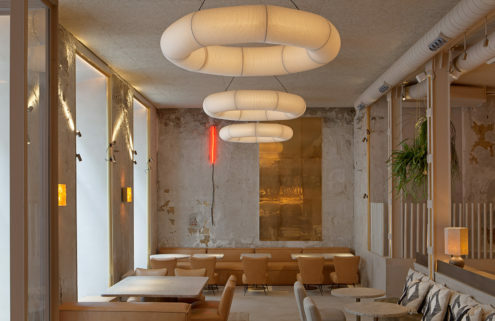 The restaurant has been loosely divided into two levels: the front space is capped by a circular chandelier studded with jewel-like lights, and is reserved for sweet treats and drinks. Walls of the main dining room are clad in pink-hued dichroic glass and Novelda marble. 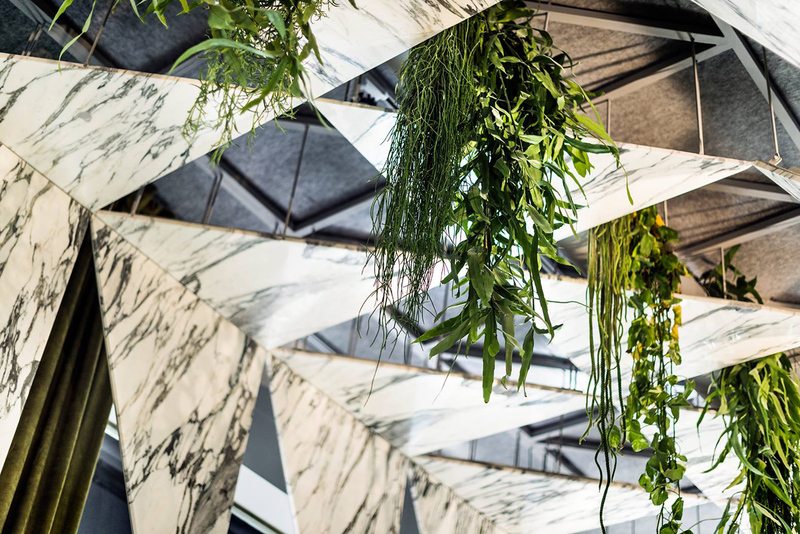 Triangular cuts of marble have been suspended from the ceiling to create a geometric canopy, from which hanging plants drip. Extra details include olive green velvet drapes, and chrome and gold framed coronet chairs. Rómola’s mantra is ‘all the pleasure, no guilt’ and the menu – designed by chef Jorge Reina in collaboration with nutritionists Pronaf – pedals healthy eats. Caloric values are listed alongside dishes, while preservatives, additives and refined sugars have been banished in favour of organic freedom foods. Expect dishes like scallop ‘empanadilla’ with corvina acevichada, and light-bites such as spelt toast with vegan sobrasada.